THPBlog: Fruit Growers Supply Company planning THP SW of Burney, CA. Fruit Growers Supply Company planning THP SW of Burney, CA. THP 2-13-084 SHA (Gasline THP) Fruit Growers Supply Company, 1989 acres; 67% group selection, 13% shelterwood, 9% no-harvest, 8% clearcut, 2% commercial thin logging. Terry Lake, Washburn Bue Park, Jackrabbit Flat (MD: T34N R2E Sec.1; T34N R3E Sec.6; T35N R2E Sec.25, 26, 35, 36; T35N R3E Sec.29, 30, 31, 32). Winter operations, low erosion hazard, slopes up to 45%, oversized units, herbicides, goshawk within 1 mi, osprey sightings nearby, fisher and badger sightings, trees over 100 years old. Estimated public comment deadline: 12/07/13. 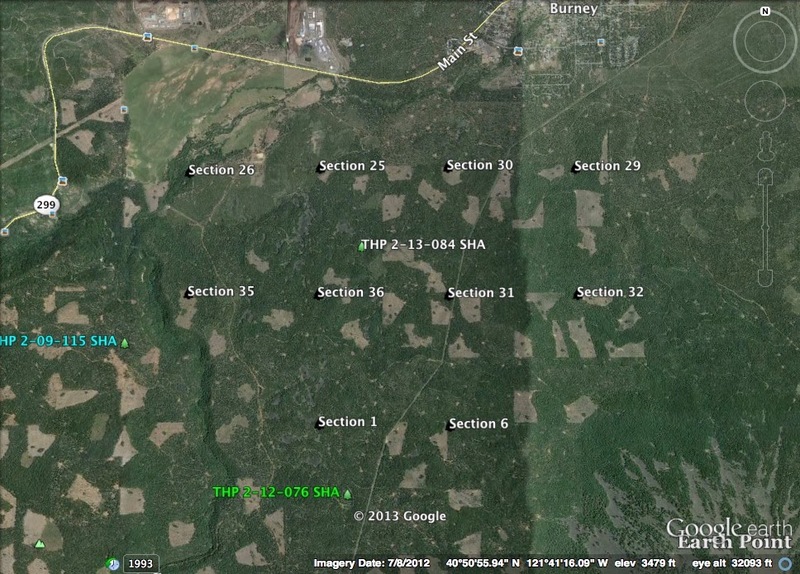 This THP is just south and west of the town of Burney, CA at an elevation of 3,200 to 3,900 feet. Fruit Growers Supply Company is planning a tractor based logging operation in white fir, sugar pine, ponderosa pine, Douglas fir, incense cedar and lodgepole pine forest. The THP area flows into Burney Creek, Lake Britton and the Pit River above Lake Shasta. Fruit Growers Supply Company is claiming the presence of insects and disease mostly affecting the white fir stands and will do some sanitation salvage logging within the shelterwood units. They want to use a portion of a landing and skid road within a class III watercourse, and there are 9 road drainage sites planned for work including rocking, dip construction, ditch cleaning and culvert repair and replacement. Three occupied osprey nests, and 1 unoccupied osprey nest were reported to be nearby in the adjacent Fruit Growers Supply Company’s Pipeline THP 2-12-076 SHA. There is a 2004 report of a goshawk stand 1 mi south of the THP area, and 3 pacific fisher, 2 american badger and 1 great gray owl (1991) sightings. 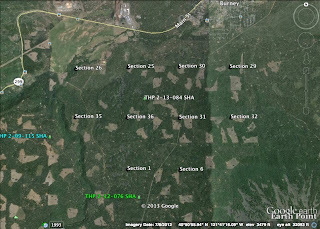 This THP is also close to the recently submitted FGS Town THP 2-13-080 SHA which is on the NW side of Burney, CA. More information is available on the THP Tracking Center website.